Welcome back! We are now on day 7 since arriving in the study area. It is Thursday 10 December 2015. Yesterday and today we are working around West and East Montalivet Islands (see map below). Area surveyed by RV Solander on 9-10 December 2015. The towed video transect near Biddles Rock is marked with a red X. After a full day of watching nothing but sand, sand, and more sand appear on-screen from the AIMS underwater towed video camera, Marcus and Neill got a big surprise while running a transect north-west of Biddles Rock (see map above). The towed video was moving through a large group of fish swimming together – sometimes called a swarm. According to Mike Cappo, a fish expert from AIMS, these fish (see below) are most likely ponyfish, known to local trawlers as ‘snotties’. As you saw in the video, these fish darted to and fro very quickly, making it tricky to capture a clear image of a single fish. That’s why we can’t tell you exactly which kind of fish they are. What is a fish swarm? A swarm happens when animals of the same type and of a similar size group together and move as one. With birds, it is called flocking. With zebras, antelope and sheep, it is called herding. With fish, it is called shoaling (if they are gathered together for social reasons) or schooling (if they are swimming together). Large groups of similar looking fish swimming together may confuse predators who have trouble selecting a single fish to eat. 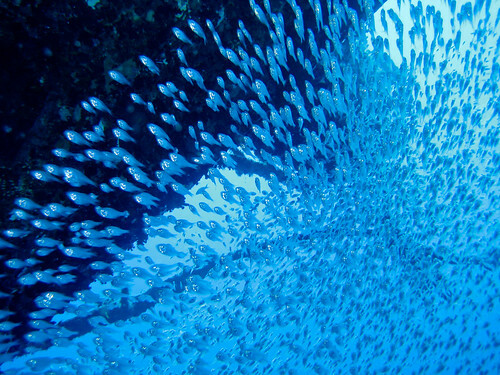 Hunting together may make it easier for swarming fish to find food. Swimming close together may make it easier to swim just as when the lead cyclist creates easier riding conditions for the riders immediately behind. How to find a fish swarm? One way is to accidentally drive the tow video system through the middle of one, like we did! Our multi-beam sonar sends sounds downward and the time it takes for them to reach the bottom, bounce off it, and return to the sonar array on the ship tells us how deep the sea floor is. The Solander’s depth sounder works in a similar way. Once I dragged myself away from watching the swarming fish on the live feed from the towed video, I captured a shot of the Solander’s depth sounder (below). Parts of the fish swarm can clearly be seen on the depth sounder (red blobs). Red on the depth sounder picture below indicates a strong sound pulse received by the sonar. The solid red line at about 27 metres depth is the sea floor, where you’d expect to get lots of sound bouncing back to the sonar. The other red blobs throughout the water column are groups of fish. You can see why depth sounders are also known as ‘fish finders’!